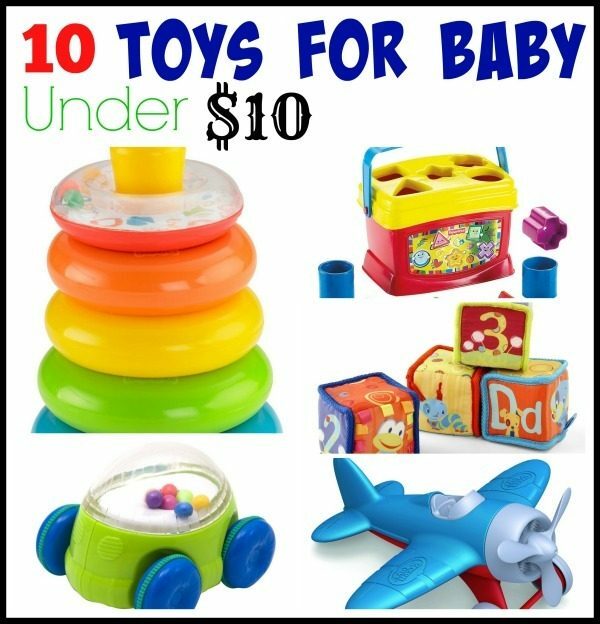 10 Toys for Baby Under $10! You are here: Home / Great Deals / Amazon Deals / 10 Toys for Baby Under $10! Have a baby in the family and looking for some fun gifts for the holidays? We’ve got you covered! Check out our list of 10 Toys for Baby Under $10! Sassy Pop n’ Push Car – $4.97 + FREE shipping with a $35 purchase! Baby Einstein Bendy Ball – $5.30 + FREE shipping with a $35 purchase! Bright Starts Start Your Senses Sensory Giraffe – $6.25 + FREE shipping with Amazon Prime or Super Saver Shipping! Fisher-Price Brilliant Basics Rock-a-Stack – $7.47 + FREE shipping with Amazon Prime or Super Saver Shipping! Munchkin Lazy Buoys Bathtub Toys – $7.91 + FREE shipping with Amazon Prime or Super Saver Shipping! Prince Lionheart Jumbo Toy Hammock – $8 + FREE shipping with Amazon Prime or Super Saver Shipping! Bright Starts Grab and Stack Blocks – $8 + FREE shipping with Amazon Prime or Super Saver Shipping! Fisher-Price Brilliant Basics Baby’s First Blocks – $9.15 + FREE shipping with Amazon Prime or Super Saver Shipping! Green Toys Airplane in Blue – $9.74 + FREE shipping with Amazon Prime or Super Saver Shipping! Fisher-Price Brilliant Basics Corn Popper – $9.99 + FREE shipping with Amazon Prime or Super Saver Shipping!